Across Latin America, several countries have witnessed a growing number of strikes and marches organized by students and teachers who are protesting the current state of their national education systems. While student protests, such as the ongoing movement in Chile, tend to call for better quality and greater access to education, teachers are more inclined to demand increased pay and improved tenure. In the past month, teachers unions in a number of Latin American countries, including Uruguay, Argentina, Venezuela, and Mexico, have organized national strikes that often put children out of school for days. Particularly in Mexico, these strikes have been extremely disruptive and violent, resulting in widespread destruction and unrest. While Argentine unions are demanding fiscal reform through widespread peaceful strikes, the National Union of Education Workers (Sindicato Nacional de Trabajadores de la Educación; SNTE) in Mexico is supporting destructive acts of violence aimed at preventing educational reform taking place. Such violence calls into question the political undertones and moral commitments of the union, which is supposed to be representing a noble profession. Teachers unions normally are powerful organizations that give a strong voice to traditionally one of the most underpaid and underappreciated occupations in the world, but teachers must be careful with how they wield this power. Violence simply does not advance the plight of underpaid teachers when reform is on the line. The violent protests encouraged by Mexico’s SNTE contrast greatly with the teacher strikes organized by unions in Argentina, which predictably have been much more effective in spreading awareness and achieving marked change. In Mexico, members of the SNTE have been up in arms since late February of this year, when the recently elected President Enrique Peña Nieto followed through on his campaign promise of education reform and began to enact changes to the old system. On February 25, Peña Nieto signed legislation that largely shifted control of the education system from the SNTE to the federal government. One day later, the then-leader of the SNTE, Elba Esther Gordillo, known for her corrupt practices and extravagant lifestyle, was arrested for charges of embezzlement and corruption. Presently, Peña Nieto is especially anxious to pass reform and quash corruption to prove that his party (the Partido Revolucionario Institucional; PRI) is no longer the authoritarian, corrupt organization that it once was. He has recently reoriented Mexico’s national security strategy to focus on reducing violence. Thus, demonstrations of force on the part of the SNTE may not have that much of an effect. The SNTE, which was founded in 1943, has dominated Mexico’s education sector for decades. Because the union was formed just shortly after the creation of the country’s national education system, union officials were able to become deeply involved in the process of hiring faculty and staff, and members often benefited from easy access to jobs. As the largest union in all of Latin America today, the SNTE has tremendous political power and has been able to block any potential overhaul of the old system up until this point. Unfortunately, union and national priorities regarding education do not align as the SNTE has been plagued by corruption since its foundation. In 2009, Mexico placed 48th out of 65 countries on the Program for International Student Assessment (PISA) test. This statistic is particularly alarming considering that Mexico spends more than any other OECD country on education, with roughly one quarter of the government’s budget allocated to this sector. It has been estimated that up to 90 percent of these funds are directly allocated for teacher salaries, with little resources left for school supplies and maintenance. SNTE influence has clearly prevented the education budget from being appropriately allocated by ensuring that most funds are earmarked for its members’ paychecks. Recent events in several states across the country, including Oaxaca, Guerrero, and Michoacán, seem eerily reminiscent of the fatal 2006 protests. In reaction to President Nieto’s plans for reform, union members have taken to the streets, blockading major roads and shopping mall entrances, as well as vandalizing local political party offices. Currently, the Peña Nieto Administration is adamantly refusing to negotiate with the SNTE. On April 12, Secretary of the Interior Miguel Ángel Osorio Chong stated, “We’re not going to respond to the threats they’ve been making. We believe there are limits and the limit is the rule of law.”  The destructive nature of the union’s backlash against Peña Nieto’s reforms only serves to further increase the president’s determination to ensure that substantial change finally occurs. Throughout Argentina, unions are very appealing to teachers for the support that they provide. Out of 650,000 teachers, roughly 350,000 are unionized, comprising roughly 55 percent of all teachers in the country. This rate is one of the highest among professions nationwide. The Unified Union of Educational Workers in Buenos Aires (Sindicato Unificado de Trabajadores de la Educación de Buenos Aires; SUTEBA) played a major role in organizing strikes in the province of Buenos Aires, where it consists of more than 100,000 members. The Argentina Confederation of Educational Workers (Central de Trabajadores de la Educación de la República Argentina; CTERA) has provided crucial advocacy for widespread and effective strikes over the past several months. Teachers’ strikes have not been entirely peaceful, although in the last case it was the authorities rather than union members who instigated the conflict. In 2007, a high school chemistry teacher was killed during a march after police hit him in the head with a tear gas cartridge. Instead of spurring further violence, this tragic death resulted in an organized, nationwide protest. The strikes that began in February were largely initiated by outrage that teachers’ wages were not rising at the same rate as the country’s cost of living. Argentina’s soaring inflation rate is officially logged at 10.3 percent according to the government’s Instituto Nacional de Estadista, but private economists have estimated that the true inflation rate may be as high as 25 percent. Unions began the strikes with demands for a 30 percent wage raise, and refused to budge throughout months of debate. The peaceful obstinacy proved effective, as negotiations gradually shifted in the teachers’ favor over time. The government had initially offered teachers a mere 6 percent raise, but union leaders were ultimately able to score a 24.5 percent increase in salaries, which will be paid out in two installments over July and September. The success of unions such as SUTEBA and CTERA serves as proof that sustained, nonviolent protests are a powerful leverage tool in gaining the upper hand of negotiations. The recent protests and strikes in Mexico and Argentina demonstrate the wide range of effects that teachers unions can have on a country’s education system, depending on their activism strategies. While Argentine unions succeeded in gaining a substantial pay increase for the nation’s teachers, Mexico’s SNTE has only managed to drive a deeper wedge between the Peña Nieto Administration and the protesting teachers through brash acts of violence. Teaching is an honorable profession that is vital to ensuring the future wellbeing of any country, and it is important that teachers unions reflect the integrity of the profession that they represent in order to more effectively create lasting change. Not only are violent protests on the part of teachers unions questionable in terms of upholding moral principles, but they are also counterproductive to reaching any form of bona fide agreement with the governing administration that all parties can agree upon. Garcia, Denisse. Harvard University Institute of Politics, “Peña Nieto and the Unions.” Last modified 2013. Accessed July 3, 2013. http://www.iop.harvard.edu/peña-nieto-and-unions. Ministry of Public Education, “Educational Development: National Report of Mexico.” Last modified April 2001. Accessed July 3, 2013. http://www.ibe.unesco.org/International/ICE/natrap/Mexico_Scan_1.pdf. Lopez-Acevedo, Gladys, and Salinas Angel. The World Bank Latin American and the Caribbean Regional Office, “Teacher Salaries and Professional Profile in Mexico.” Last modified February 2001. Accessed July 3, 2013. http://ddp-ext.worldbank.org/EdStats/MEXlac02.pdf. Lacey, Marc. “Mexican Forces to Move to Retake Oaxaca.” The New York Times, October 30, 2006. http://www.nytimes.com/2006/10/30/world/americas/30mexico.html?pagewanted=&_r=1& (accessed July 3, 2013). “Mexico’s Enrique Peña Nieto Faces Backlash Over Education Reform.” Fox News Latino, April 14, 2013. http://latino.foxnews.com/latino/news/2013/04/14/mexico-enrique-pena-nieto-faces-backlash-over-education-reform/ (accessed July 3, 2013). 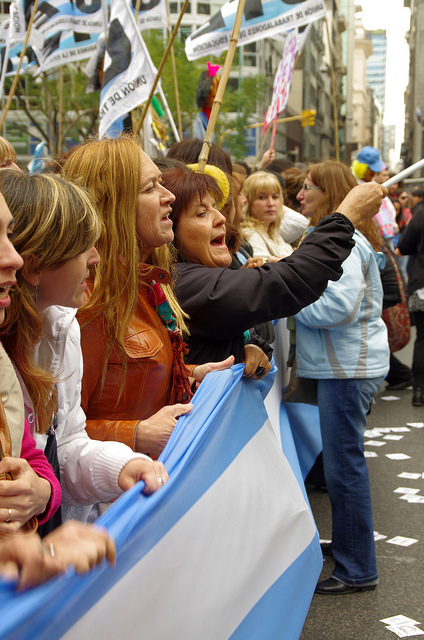 “Buenos Aires Teachers Agree Salary Terms.” The Argentina Independent , June 6, 2013. http://www.argentinaindependent.com/currentaffairs/newsfromargentina/province-teachers-agree-salary-terms/ (accessed July 3, 2013). “Mexico’s Enrique Pena Nieto Faces Backlash Over Education Reform.” Fox News Latino, April 14, 2013. http://latino.foxnews.com/latino/news/2013/04/14/mexico-enrique-pena-nieto-faces-backlash-over-education-reform/ (accessed July 3, 2013). Auguste, Sebastian, Echart Maria, and Franchetti Francisco. Inter-American Development Bank, “The Quality of Education in Argentina.” Last modified January 2008. Accessed July 3, 2013. http://www.iadb.org/res/laresnetwork/files/pr294finaldraft.pdf. Murillo, M. Victoria, Mariano Tommasi, Lucas Ronconi, and Juan Sanguinetti. Inter-American Development Bank, “The Economic Effects of Unions in Latin America: Teachers’ Unions and Education in Argentina.” Last modified September 2002. Accessed July 3, 2013. http://www.iadb.org/res/publications/pubfiles/pubR-463.pdf. Illiano, Cesar. “Argentine Teachers Strike Over Death of Colleague.” UK Reuters, April 10, 2007. http://uk.reuters.com/article/2007/04/10/uk-argentina-teachers-idUKN0934762520070410 (accessed July 3, 2013). Roth, Charles. “Argentina’s Inflation Dilemma.” The Wall Street Journal, May 15, 2013. http://blogs.wsj.com/economics/2013/05/15/argentinas-inflation-dilemma/ (accessed July 3, 2013).